Italy - IOM reports that 314,003 migrants and refugees entered Europe by sea in 2016 through 5 October, arriving mostly in Greece and Italy. 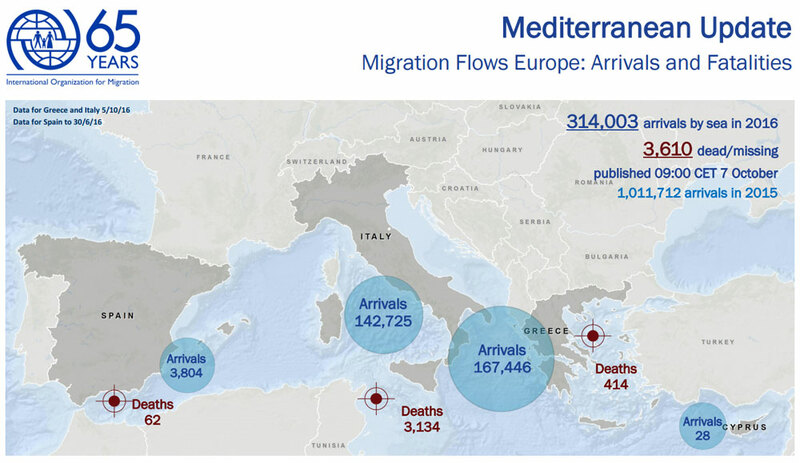 Some 167,446 people have arrived in Greece and 142,725 in Italy during 2016. The total is well below the number of arrivals at this point in 2015, by which some 518,181 migrants and refugees had made the journey. However, the death toll in 2016 is higher. This year some 3,610 people have drowned or been reported missing in incidents off Egypt, Libya, Greece, Italy, Turkey, Morocco and Spain. In 2015 at this time, the total was 3,029. For the whole of 2015, IOM’s Missing Migrants Project calculated 3,673 people were confirmed dead or missing. IOM Rome reported Thursday that 11,432 migrants were rescued in the Channel of Sicily this week. After the peak arrivals of Monday (6,000) and Tuesday (5,000), arrivals slowed by mid-week. On Wednesday just 363 migrants were rescued. Some 38 bodies were recovered, including 22 victims of asphyxiation. So far in 2016 the Italian Ministry of Interior has registered 142,725 arrivals by sea, up 6 percent from the same time last year. “Migration flows towards Italy have remained essentially unaltered compared to 2015,” said Federico Soda, Director of the IOM Coordination Office for the Mediterranean in Rome. “We also noted an increase in West African nationalities. Often these are people who leave their country of origin without a specific destination. Libya is where many are smuggled to and the majority of migrants there face extreme violence and abuse. Some, scared for their lives, decide to continue their journey to Europe,” he added. The Channel of Sicily is currently the deadliest border in the world: 3,610 people died while crossing the Mediterranean in 2016. Out of these, 3,134 died to reach Italy, according to IOM’s Missing Migrants Project. “The increase in deaths in the Mediterranean this year is concerning for two reasons. First, this year is on track to see an unprecedented number of deaths. In 2016 we have recorded almost 20 percent more deaths and disappearances at sea compared to this time last year. Second, this year has seen a continuation of the trend of huge numbers of deaths that began in 2014,” said project coordinator Julia Black. “In each year since 2014, we have seen more than 3,000 deaths in the Mediterranean. This is about five times more each year compared to the 600 or so who died in 2013. The regularity of these high death tolls gives no indication that conditions are becoming safer for those who try to cross the Mediterranean,” she added. On Thursday IOM Athens reported that on Tuesday (4/10) Greek authorities announced that 214 migrants crossed into Greece across the Evros river on the Greek-Turkish land border. Another 372 migrants arrived by sea between 3-5 October. The largest group of 167 arrived on the island of Chios on Monday (3/10).